Where you can find fema campers for sale. FEMA (Federal Emergency Management Agency) campers represent types of houses provided by the United States government for people displaced by natural disasters. These campers gained popularity after Hurricane Katrina hit the coastal areas next to New Orleans. They were designed to provide temporary housing allowing residents of an impacted area to have a place to live during the time required to repair (re-build) their damaged houses. FEMA campers come fully equipped with furnishings. Typically in the central part of the camper there is a large single room designed as living area. Next to it there is a kitchen with stove, refrigerator and microwave. Also there are bathroom and master bedroom. These campers include hot and cold running water, air conditioning and heating. They are mass-produced which means that each model is almost identical in furnishing and layout. They have all necessary hook-ups to provide external connections for electrical power, water-sewer, telephone, TV cable and Internet access. In recent years, since a great number of people throughout the United States lost their jobs, they were forced to sell their houses and to buy and move into FEMA campers. After the destructive hurricanes hit the Gulf Coast, FEMA spent a considerable amount of money on buying lot of trailers, campers, motor homes. Many of them were never in use. Couple of years later, the government started selling these campers at very low prices. Most of them are still in quite good conditions, however even those damaged are relatively easy to fix due to their modular construction. The good news is - FEMA campers are extremely affordable. Purchasing such camper could save you thousands of dollars especially if you find one that was used gently and for short-time only. It may be almost like new. If you are interested in buying such camper you might wonder where you can buy it. There are several options where you can find FEMA campers on sale. • State and local auctions – Search for state and local government websites and search for auctions where you may find these campers on sale. • GSA Auctions – The General Services Administration is federal government agency which deals with auctions. • GovSales – is also government site offering online auction. In order to place a bid you have to register on this site. Warning: There are some rumors that FEMA campers were built either from not "first grade" materials or using faulty production process. As the result they may show inside increased level of hazardous chemicals (formaldehyde) that may impact the health of inhabitants! The easiest way you can find a fema camper for sale is to closely keep an eye on the auctions organized by GSA (General Services Administration) which works in partnership with the US government. There is a listing in the menu on their webpage with all the extra assets they wish to sale through public auctions and among them you can find the “Trailers, Tractors and Manufactured Housing” link that can lead you to some pretty good deals. The campers they sell are mostly second hand and need some repairs done, but nonetheless they offer bargains. 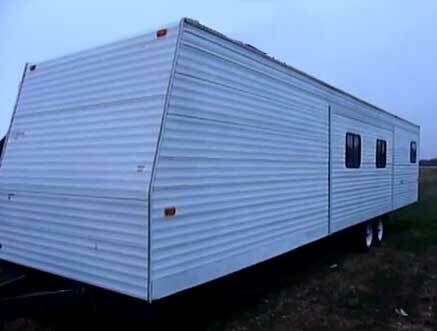 The fema campers for sale on this website can go up to $7,000 or even more, but you can also find prices as low as $200! Don’t let the low prices scare you away, the fema campers available at this price are usable and most of the times you only need to invest $1000-$1,500 to get them on the road. Anyway, most of these campers are hardly use and many of them are as new. If you keep an eye on the auctions, the chances are that you’ll get yourself an almost brand new camper for an incredibly low price. That happens because FEMA still has around 100,000 campers in stock and they’re trying to get rid of all as soon as possible. It’s very important that you find a website where auctions in your area are listed. You need to search for them nearby as having them shipped to you from the other part of the country isn’t such a good idea, as the transportation might sometimes cost you more than you actually paid for the fema camper itself. An example of such website is buyingusedrvsforsale.com. You can find here almost anything related to campers, from used camper dealers to travel trailers for sale in different locations.